I’m in that in-between stage where I’m waiting for more projects (which are on the way, but not here yet- argh!). When Betsy McCarthy (author of Knit Socks) was on the Today Show, she said that the challenge of working at home is learning to live with ambiguity. Let me tell you, it still freaks me out. Nevertheless, even though I sometimes feel guilty or like I should be swatching or doing something super-directly related to getting more work, I like use my down time to work from patterns–for all of the same reasons that I’m sure most of you do. It’s relaxing, it lets my mind wander, it helps me connect to my crocheters (and see what works and doesn’t in pattern writing), etc. Plus then I get to try out new yarns that *I* want to try, and I get to see how other people put things together. I had a crazy cold last week and my concentration flew out the door anyway, so it was prime-crocheting time. The first thing I picked up to keep my hands busy was my own Blooming Sun Hat (my design, in Crochet Today May/June 2010) worked in Knit One Crochet Too’s Ty Dy Cotton. I have been reading about the yarn on Ravelry, and crocheters like it because it has long color repeats (important for the tall and yarn-eating crochet stitch). I finally found some of it close-to-locally when Paul took me on a Hill Country Yarn Crawl of my very own for my birthday last month, so I bought a ball to swatch with. 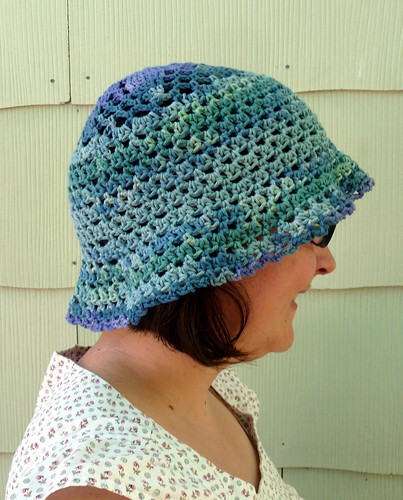 The yardage is generous –another plus for crocheters!– so I figured I would be able to make the hat with enough to spare for swatching. Overall, I like how the coloring worked out, but I actually think that a stiffer cotton (such as the Red Heart Eco-Cotton I used for the magazine) was well suited for this hat, as it made the whole thing a bit more stiff. A cotton linen blend would be nice as well–it all depends what you are going for. I do love that the lighter weight of this yarn and I already wore the hat outside to do some gardening this morning. I’m also thisclose to finishing another pair of Easy Does It Crocheted Socks from the aptly named book, Crocheted Socks: 16 Fun-To-Stitch Patterns . I started these with my sock class that I taught at Yarnivore using Stroll sock yarn from Knit Picks (leftover from a forthcoming design). Since I needed a sock to demonstrate on I figured I would go ahead and make the pair, I just made them short anklets since I had used part of the skein for the other project and knew I wouldn’t have enough to make a full cuff. I am proud to say that I guessed just right and ended up with just a few yards left of yarn– it feels so good to USE it UP sometimes, doesn’t it? I have so much stash leftover from book and mag projects and I really hate to let it languish, but I do start to get sick of a yarn if I already made the intended project, the scrap project, and still have more left! Heh! Anyway, the socks fit perfectly, I just need to sew up the toe. 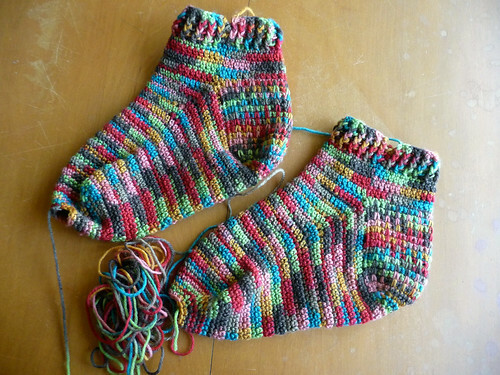 Unfortunately, in my opinion these socks are an example of what short color repeats look like in crochet—ugly. While I love the colors of this yarn, I don’t really like the way it pooled here, which happened because the repeats are too short (for this stitch pattern, in crochet). If you end up with a yarn like this, try alternating it with a solid to space out the pools–that’s what I did for the forthcoming project and I like it much better. But, hey, free socks to wear around the house! The last thing in the works right now is actually on my knitting needles– I got them out last night and cast on for my Rippley Sweet BonBon Baby Blanket, a free pattern on Ravelry, from Austin’s great yarn shop, Hill Country Weavers. One of my favorite students came in with the yarn and pattern for a couple of these and I helped her with them, and then when I was in their store this weekend I could no longer resist starting my own. I had about 3 skeins of Blue Sky Alpacas Dyed Cotton left over from Tricia Royal’s Mod Cross Pillow in Crochet Adorned and they all matched well with one of multicolored Filatura Di Crosa Bon Bon skeins (the pom-pom yarn) in the store, so I went ahead and got it, along with the red cotton. I’m going to make my blanket stripey so I can work with what I have. This is another favorite way for me to use stash/leftover yarns–buy just a little of something new to make them fun again. And- knit with them instead of crocheting with them (or vice versa). The stitch pattern on this project is relatively simple but I find that it helps to place a marker between each repeat so that if you get hung up somewhere it’s easy to follow the repeat and figure out which section is the problem. It’s very addictive to work this, too- in fact I’m trying to avoid it right now so I can actually get some things done today. That’s what’s new over here– what’s on your hooks and needles? Oooh, that baby blanket is going to be sooo adorable! Linda! I didn't know you were at Renegade! That place was huge... I think I only got around to 1/2 the vendors myself. I think the last Renegade I was at (before this one) was the one in Brooklyn three years ago, when we passed out all those copies of Adorn in the hot sun. Are you living in TX now? I was scoping out your Etsy shop and it said you were in San Antonio? 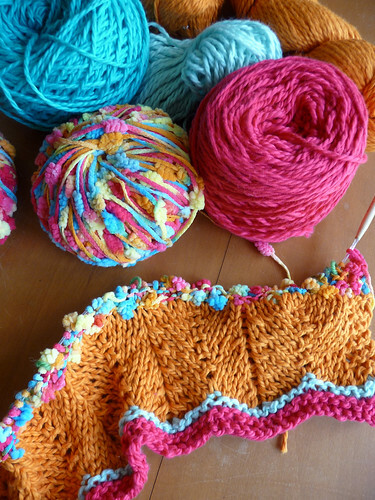 Love the colour combos on the bombom blankie!